The following 7 pages is from a story I worked on a while back called Tension.There was a total of about 12 pages I believe. I'll post them here when I get ahold of them. I thought I'd throw these up here. I had forgotten all about them until I started organizing my studio again. 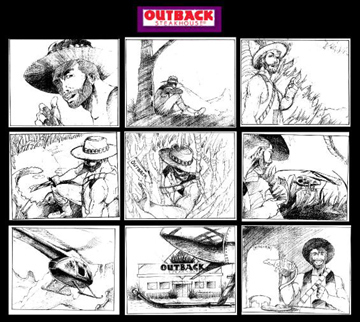 Below is a stroryboard I was asked to do for a proposed commercial for Outback Steakhouse. So I really don't know if this commercial every came to life considering there as so many commericals that we never see, this could be one of them.